Newport Surf Club has elected Sandy Menzies as president for the 2014/2015 at the club's Annual General Meeting on Sunday 27 July. Michael Rosic was elected deputy president, Rob Barkley club captain, Jane Steinart secretary and Alan Channels will take over the role of treasurer. Sandy joined the club in 1995 when her daughter Jess started in Nippers. She completed her Bronze Medallion in 2000 and has been patrolling ever since. She has been first aid officer and was club secretary for three years. Sandy has held the position of chief instructor as well as deputy president. With her husband Doug, Sandy started the special needs nipper group with Doug in 2002, and she is still the age manager for the group. Sandy paid tribute to Rob Emerson the outgoing president. "Rob has successfully steered the club through a time of great growth and amazing competition success. He has brought his management skills to the job of president with effective sub committees being created to help provide greater involvement by members and to harness the available skills," said Sandy. Long Service Newport club member Col Maclean was elected a Life Member of the Newport Surf Club at the AGM. His nomination was strongly supported by a number of Life Members. Col joined the club in 1973/74 but had been a member of the Freshwater club before joining Newport. He has been very active in the club throughout his 40 years service and has been a champion board and ski paddler. He has built a reputation as being always available to help out in any capacity including many patrols . He was chairman of the club's Centenary Book committee and it is generally acknowledged that magnificent history book would not have been completed without his drive and determination. Col's dedication to the club is well known and his elevation to Life Member was greatly deserved. Doug and Sandy Menzies at Branch Awards last month - picture courtesy SLS SNB. What a team this family is and what a contrubition they make to Surf Life Saving on the Northern Beaches. Doug Menzies is the new President of Sydney Northern Beaches Branch and now wife Sandy has taken over the reins at Newport Surf Life Saving Club. "I just hope I can do as good a job as what Rob Emerson [former club president] did,'' says Sandy, who becomes the first female president in the club's 105-year history. While Sandy leads the club, two of her children, Kieran and Jess, won Branch Awards this year ( the Raymond Matthew Brown [OAM] Radio Operator’s Award and Dee Why RSL Facilitator of the Year award respectively). and youngest son Brendan helps with Special Needs program Sandy and Doug initiated in 2002 - A real surf family. “I am very proud of my family and their achievements,’’ Doug said last month. “They all do it for their own personal reasons. Each has picked up a different area of surf lifesaving that they have a particular passion or interest. “Kieran, particularly, with the radio room, jet ski and IRB, Jess is the club [Newport] Vice-Captain, Patrol Captain and does lots of training and assessing and is a Facilitator and Brendan helps with Special Needs, trains and assesses. Sandy and Doug started the Special Needs Program back in 2002. “That has been one of our greatest achievements in terms of making surf lifesaving available to those with disabilities who traditionally haven’t had an opportunity to take part in such a great culture,’’ says Doug. 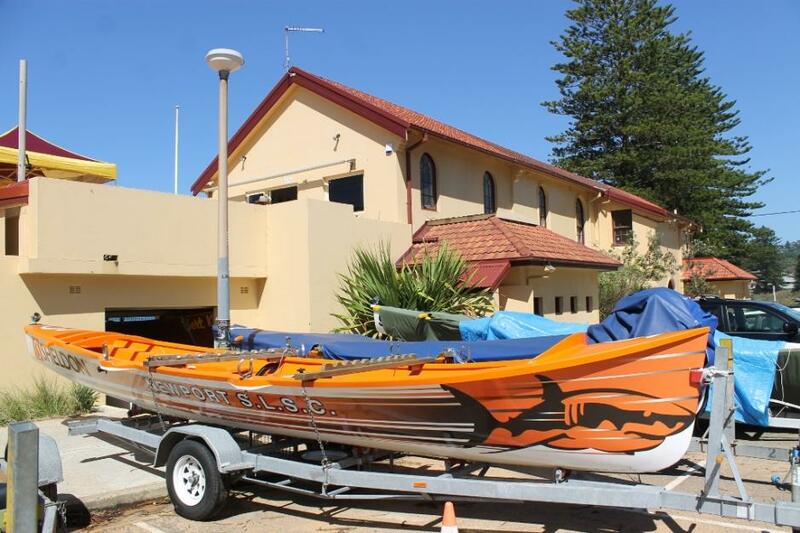 They also helped South Curl Curl SLSC set up a program. “I have worked with SLS South Australia to provide some advice in relation to the program we ran,’’ Doug said recently. Husband Doug, who stepped into the Branch President’s role vacated by former President David Murray at the Election Annual General Meeting on May 6, has also served at Newport SLSC as President for five terms. He is a Life Member who has spent 14 of his 20 years at Newport on the Committee. Doug stood down as the Club’s Deputy President last year to take on the role of Deputy President of the Branch, replacing Christine Hopton when she became an Independent Director of SLSA. In other Newport SL:SC news Karen Hennessy is Nippers Chairman for the first time while Rob Emerson will continue to sweep surf boats. The Club will celebrate their 105th year at a special cocktail party in October. We have also received news on Friday (August 1st, 2014), of a special Surf Boat Sweeps Convention that is scheduled at the end of August to be held in the Newport SLS clubhouse - more details as they come to hand.